When I first discovered SimplyWell’s beautiful space, I fell in love with the concept and loved that Kingston finally had a delicious juice spot. When I found out the owner was an ambitious young woman, I was so impressed and interested to know how she got her start. 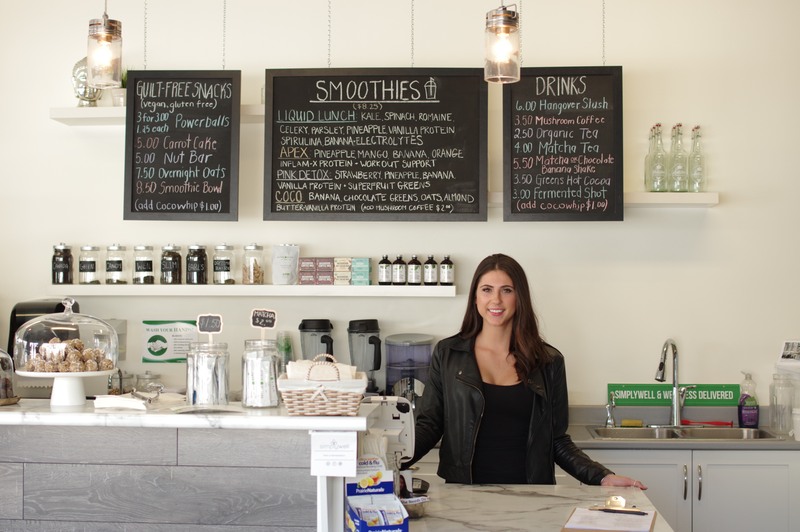 In two years, owner Jehna Duncan – with the help of her team – has turned SimplyWell into a holistic one-stop shop catered to helping people with digestive health issues. 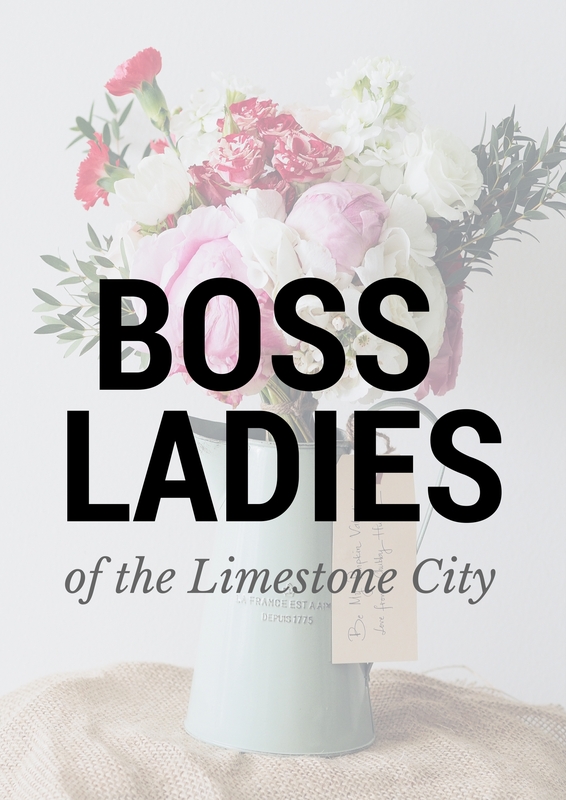 After sitting down with Jehna, I learned that her journey to business owner is filled with girl power because of the encouragement of other Kingston Boss Ladies. Learn how this Boss Lady went from selling her juices in the market to her light-filled storefront on Princess street. Keep up with Kingston: Why did you choose Kingston to live and grow a business? Jehna Duncan: I love Kingston. I’ve always loved it. I think that growing up here was different than now. The scenes are different. All of my friends from high school and everything all moved to Toronto and bigger cities so it’s a whole new Kingston when you’re in the work field. I didn’t think about starting a business here. It just sort of happened and then I was in it [laughs]. I know for a fact I wouldn’t have done it anywhere else. KUWK: So how did it happen that you found yourself starting SimplyWell? JD: I’ve always been interested in nutrition. I went to school in the States and got really, really sick and my neighbour – a homeopath – nursed me back to health. She broke everything down for me and was like “you’re very unwell, here is how you’re going to get better.” And then I became obsessed with it. I was studying nutrition all of the time in my spare time. I started changing all of the University courses to nutrition courses and made sure they were relevant with my psychology courses. Then I got a job at her clinic. While I was working there she offered to pay for my school to become a nutritionist. Then I got a juicer for Christmas so I started making juice and one of my coworkers was like, “you’re going to start selling juice” to my friend who owns Cher Mere, Aba. And then I sit down with Aba and I am super nervous and just explaining that I am just making juice at home for myself. I’m just like, “listen, I don’t have a business. This is an idea” and she’s like “let’s just do it.” She’s super laid back and casual and she’s like, “it’s fine! we’re gonna do it. We’ll start in June.” And this was in February so I thought, “Okay, great, just have to figure out how to start a business before June. Carly from Life Yoga is who encouraged me to open as well. She said, “I am going to sit you down once a week and we are going to figure out how to do it.” And then Aba and Carly started selling the juice and it just took off from there. JD: Literally. That’s why I always think I could never do this anywhere else but in Kingston because one person says, “yep, this is going to happen” and then everyone jumps in and helps. KUWK: So, between February and June you launched an entire store. JD: So I launched in May 2015 and six months later I got the store. So everything moved really quickly. I sold the juices at the market and at Cher Mere and Life Yoga and then online. Mostly they would just pick it up at the market and then it became too much because I was juicing all night because I needed a commercial kitchen, I would drag my poor mother with me. So we were juicing all night and then would go to the market at 6 in the morning. My best friend’s mom is a realtor so she called my mom one day and was like, “Hey, I found the perfect space for Jehna to open the store.” And they sat me down and said, “Okay, you’re going to do this and it’s going to be okay.” So basically I have the best ladies in my life ever. It was really collaborative. JD: It’s been crazy. It feels like it’s been ten years and also five minutes. It’s so weird. When we first opened I didn’t really know what it would be because just the juice isn’t really sustainable but having Devon doing nutrition it just kind of grew. We thought, “let’s do everything.” Two nights before we opened we decided to make smoothies and six months after we decided to really look closer at the smoothies and now we are more a smoothie bar than a juice bar. It’s just going to be what it’s going to be. KUWK: You’ve touched on this, but tell me the perks of being a young woman and owning a business in Kingston. JD: I think the biggest perk is this kind of thing, just getting to hanging out with the coolest people and collaborating all of the time. That’s my favourite thing. I’m really social by nature so I am always wanting to be doing things like this. I get to work with my friends whenever I want in fun, creative ways. Kingston is so accepting of new things I think. One fun thing is that I am on the retail committee for downtown and right now our big thing is supporting other businesses. People will make comments on being in competition with other businesses but I don’t feel that way about any business. That’s good because more people are in that mindset. I think that’s the biggest thing in Kingston is that everyone wants to support a local person and local businesses and everyone is really good at connecting in weird ways. Who would have thought that my business would start because of Aba who owns a spa wanted juice. That’s the coolest thing. JD: Exactly. If our downtown is doing well, then I am going to do well. If I don’t have any stores around me, then nobody will come to my store. I don’t understand people who think there is competition because we are in this together. KUWK: Do you have anything exciting coming up in the store? JD: We are kind of changing things up right now. we have a massage therapist who is starting May 1. We are shifting to be more of a digestive care centre. The massage therapy really helps move toxins, all of the supplements we are getting in are geared towards that. That’s the biggest thing, I think that’s important for people to know that everything we do is thoughtful and nutrition-based. Our staff is made up of nutritionists who thoughtfully prepare the food. Our salad dressings us high-end olive oil and people wonder, “why are they so expensive?” because we don’t cut corners.